Famed for his TV interviewing and writing, Sir Michael Parkinson is also a fan of jazz music and has spent much of his career promoting an appreciation of the Great American Songbook. In the process, he has developed an encyclopaedic knowledge of that genre, as well as interviewing some of the greats and finding time to spot new artists. This passion and love of music is celebrated in his new live theatrical show 'Our Kind Of Music'. “It’s an archival treasure trove which has never been properly mined until now, so we’ve developed the exciting new show 'Parkinson: Our Kind of Music'. I’m interviewed about my love of music and some of the musical highlights of my career by my long term producer, collaborator and son Mike. It’s a fascinating, entertaining and informative journey to my musical heart, with the help of a few heroes." Classic musical clips from Parky's archive are topped off by live performances by the multi-talented Joe Stilgoe and his band. Highlights include Michael duetting with Bing Crosby, interviewing John Lennon with a bag on his head, sitting opposite McCartney as he played ‘Yesterday’, and watching Fred Astaire singing ‘Puttin on the Ritz’. Michael Parkinson is at The Apex on Saturday 7 April at 7.30pm. 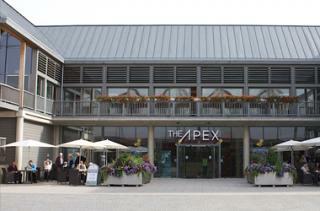 Tickets are £30, ring the box office on 01284 758000 or see www.theapex.co.uk for details.